If you ever wondered how cheese was invented, a look at Graukaese [grah-ow-kayzay] will tell it all. 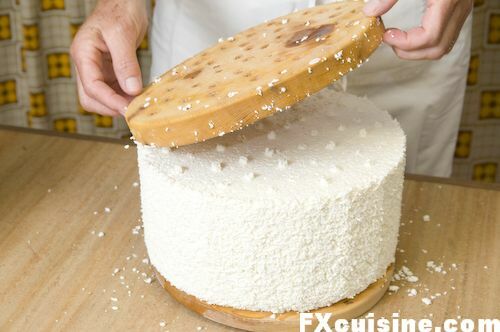 This is a primeval cheese, one of the most basic expressions of the art of cheesemaking. No bacterial culture, no rennet, no nothing. Just the milk and the man. Graukäse is a product of Südtyrol is an Austrian province under Italian administration since WWI. People speak both German and a Germanic dialect. Some also speak ladino, a romance dialect. All have learned Italian, which they speak with a very slight German accent - but don't tell them. 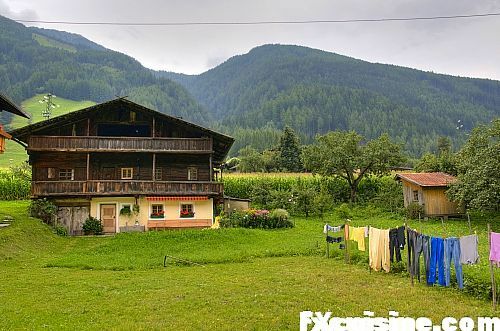 Although they love Italy very much and send their kids to University in Linz or Vienna, Austria, Sütyrol feels like a piece of Switzerland with Italian taste. Everything is clean, well-ordered. People are very polite but not all that expansive like in other parts of Italy. Towns are the realm of bicycles and pedestrians. Unlike regular Italian towns where smelly cars and noisy mopeds are dancing all day and night long. Only 50 years ago, just about everybody and his brother used to make cheese in the Alps. If you lived in the coutry, you had a few cows, and there was just no way of preserving the constant stream of milk other than making cheese. Most farmhouses had a cheese room. Recently I showed you how cheese is made when the cows are up the mountain grazing some high-altitude pasture. This is still down like in the days of yore. When in the fall the cows come down in the valley to spend the winter in the farm, nowadays most cheese is made in modern cheesemaking cooperatives. Precious few people still do it at the farm. Today, I'll show you how Martha Hofer does her own Graukäse twice a week using her three cows's milk at her family farm near Campo Tures in the Valle Aurina. Cows are milked in the morning and in the evening and both milks are mixed together and skimmed to make butter. The milk is left at room temperature for two days until it curdles by itself. 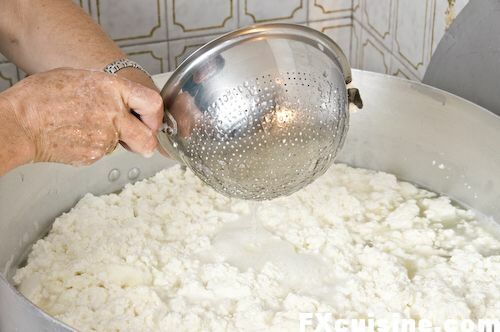 This spontaneous process is very different from what cheesemakers do when preparing regular cheese, where they add a yoghurt-like starter culture and then use rennet to make the milk coagulate. Instead, Graukäse relies on natural ferments present in the milk and in the air to coagulate the milk. As a result of the resulting intense lactic fermentation, the cheese has a strongly tart flavor. ...then drain them off to let the intensely acidic whey drip back into the pot. ... where she seasons it with a sprinkle of salt. Some cheesemakers add white pepper at this stage. 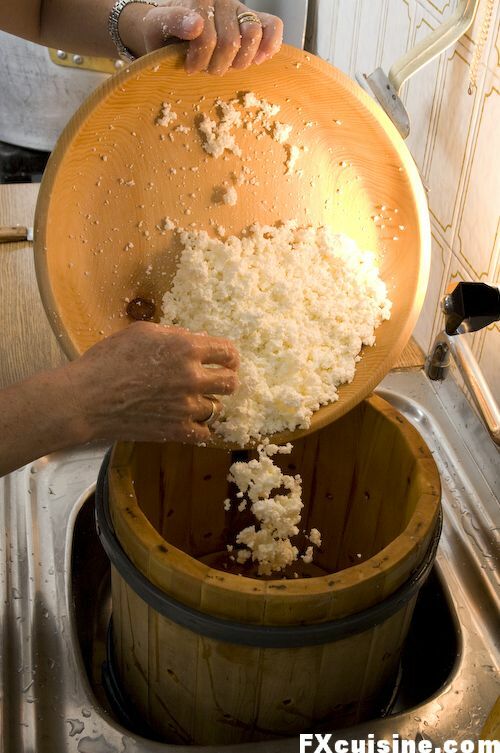 ... then the curds are poured into a large wooden barrel. 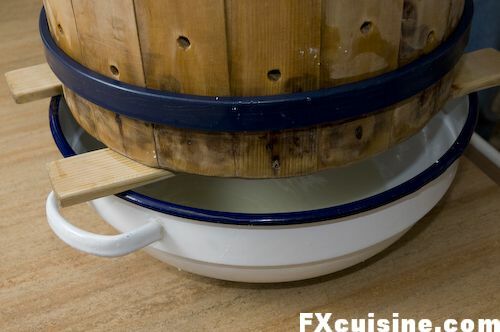 The wooden barrel is left overnight on a bowl to let excess whey drip off. ... and pours the content onto the table. ... which she moves to a maturing box. With her 3 cows, Martha Hofer makes 4 cheeses of 4kg (9lbs) a piece every week. She doesn't sell them - all of it goes for family consumption or barter with her neighbors, much like country people every where do. Sometimes the line between white and gray, edible and poisonous, is a difficult line to trace. In the case of Graukaese, this cheese was made in rather drab Alpine mazos where they would soon be covered by moulds and turn gray. Hence the name - Graukäse means Gray Cheese. Well, the only thing that might turn gray nowadays is the food health inspector's hair if you'd leave the cheese out to catch the moulds. The cheese is left for 10-15 days to mature. 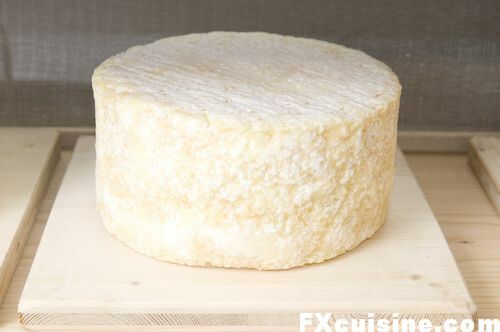 The maturation is the most extraordinary thing, with the plaster-like texture and white color slowly turning, from the inside out, into a creamy yellow rind. You only eat the exterior as it matures. If you ever happen to need to wake somebody from the dead, place a piece of Graukäse below his nose and he'll raise all right. But he might as well immediately pass out from the smell and never wish to come back, for this is a really seriously strong cheese. I think you can't really call yourself a consumate cheese expert (I don't) if you have not tasted such an uncompromising cheese. Tyrolians eat Graukäse over bread. The older, the yellower and mellower. If you could withstand the acidity, you could eat this cheese all day - it contains at most 2% fat. I like to grate it over knödels - a pungent but really interesting seasoning. Who is the best cheesemaker in the Hofer family? «Martha», answered father and son in unison. Many thanks for his helps to Martin Pircher, the big cheese in all things Slow Food in Campo Tures. 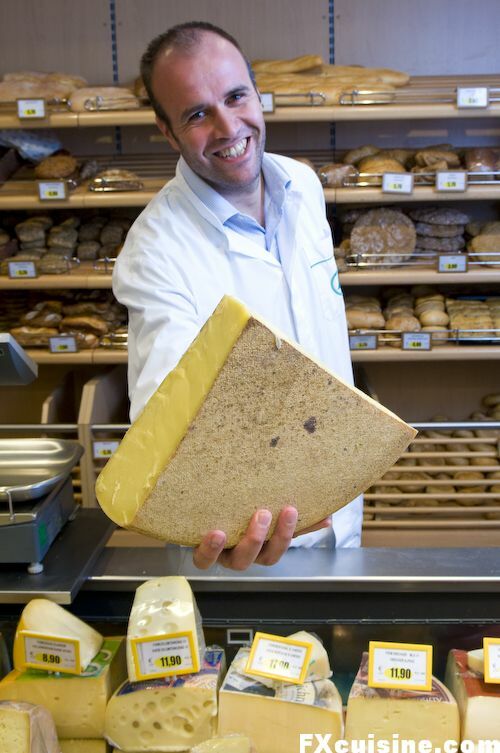 He also runs the biennal cheese festival in Campo Tures and worked to ensure the Graukäse obtained its own Slow Food presidio, a rare honor. Martin owns the local Despar supermarket in Centro Tubris, complete with the most exhaustive selection of local cheeses on offer in the area. Don't miss it. Martin organized our visit to his friend Martha in San Giovanni up the Valle Aurina from Campo Tures. A cheese festival! I simply HAVE to go! Oh, and the Graukäse sounds horrible; I'd love to try it! FX's answer→ Angelica, if you like cheese Italy is the place to go, they have even more types of cheese on record than the French. Every country market is a cheese festival! Congratulations! Another fine article. Have few questions. What is “maturing box” made of, and what is special about it (if any)? For those 10-15 days at what temperature do they keep the cheese? What are the conditions? And finally what do you mean by “You only eat the exterior as it matures”? Thank you and looking forward for the next article! FX's answer→ Vaio, the box is just made of wood with a mesh to keep rats and flies out. The cheese is kept in a cellar, slightly colder and more humid than room temperature, but but nothing special besides that. Fascinating. I will have to ask for it next time I'm at the cheesemonger. FX's answer→ Joanna, I doubt you can find this one outside Tyrol (Austria and Italy) - not much of a market I suppose! We used to eat Graukase in the late 60 and early '70s in Prettau ( at the very end of the valley that starts in Campo Tures) but it was eaten by cutting slices ( or shards) of it on a plate and then dressing it with pepper, raw onion and olive oils ( as you said there's very little fat content). We were actually told that it was so lean because not only was first butter made from the milk but also regular cheese. What was left was re-heated, much like "ricotta". So it was like the third extraction from the same milk. I guess Marta Hofer's process provides a richer and more palatable cheese that doesn't need to be dressed up. We recently paid a visit to the area (after almost 20 years after we moved from Milan to Tuscany) and bought some Graukase at the large Senni cheese factory in Bruneck but have not eaten it yet ( my wife said we need to be certain we can face the "Musik"...). FX's answer→ Pietro, this is a mighty fine joke about the musical cheese! Almost all Graukaese today is made in semi-industrial cheese workshops and not in farms anymore. I think you'd need to eat quite a lot to have to face the "music"! Cheese. The subject is so near and dear to my heart. Being Italian, cheese is very important to me. Italian, German, even American (Maytag Blue!) - Nation of birth doesn't matter, as long as it's good cheese. 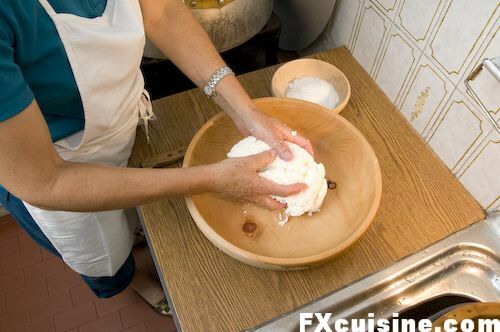 Ironically, I just saw a recipe for homemade ricotta I'm dying to try. Hardly as flavor packed as the cheeses you showcase here, I'm still itching to try my hand at ricotta. More a "mouthfeel" experience because of its mild flavor, ricotta has its own purpose in the spectrum of cheeses. 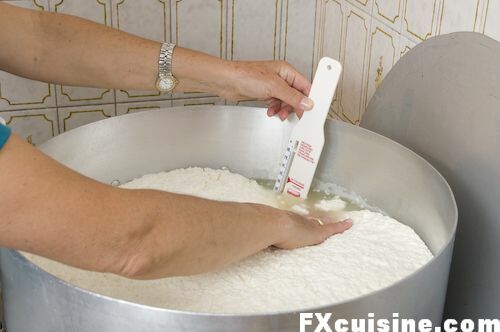 It's a good baby step into cheesemaking. FX's answer→ Chiffonade, indeed there are tons of cheeses you can make at home, ricotta and mozzarella and many others. You can even make blue cheese! FX's answer→ Carolina, I think Graukaese is strong in the taste and weak in the smell, whereas Linburger is just the opposite! As for the dream job indeed it is but we live here in the Alps never far from an interesting cheesemaker, so it is a really accessible pursuit! 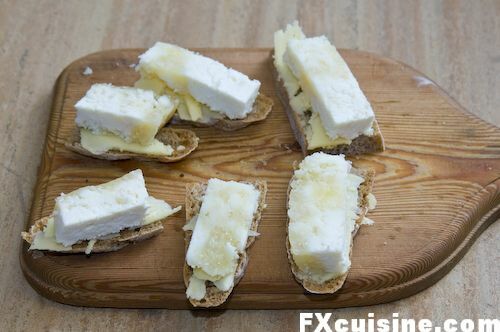 BTW; The 'Limburger-style' cheese to which I was referring was sort of a 'cross' between Limburger and Brie. It tasted and smelled like Limburger, but came in small wheels like Brie, and ripened the same way Brie did, with the soft, powdery rind, with a lovely creamy texture (until it was 'over-ripe'). I haven't had this in over 30 years, but would so love to try it once more. 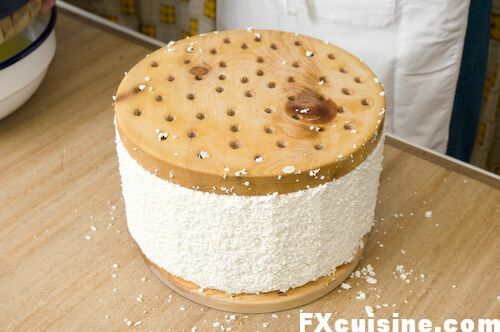 FX's answer→ Carolina, maybe you could try and recreate it at home, it is not that difficult to make your own cheese after all. But I'll make my first before saying it's easy. I got so curious about my own question I went to Wikipedia to see if I could 'search down' the cheese. I did, it was called "Liederkranz", and it is, very sadly, no longer produced. In fact, the company that used to make it now produces only 'processed' cheeses. Intriguingly, there is a rumour that the culture is still being kept alive. I wish someone would buy it, if true, and begin producing it again. It was SO good. Chiffonade wrote: "Nation of birth doesn't matter, as long as it's good cheese." So true. In addition to Maytag Blue, there are increasing numbers of excellent artisanal type cheeses being made in the US. Look for Cypress Grove cheeses (e. g., Humbolt Fog goat cheese) and Cowgirl Creamery cheeses (e. g., Red Hawk washed rind cheese). Happily, these can be found at better cheesemongers in many parts of the country. 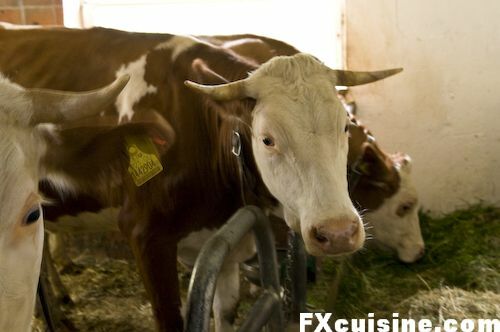 FX's answer→ I have even seen a US dairy at the Slow Food Fair in Torino! Wow, interesting ;-P! I'm an amateur of strong cheeses... Thanks for the info! FX's answer→ Rosa, this one should satisfy your appetite from strong cheese beyond expectation! Thanks for sharing. I am learning about cheese. I am American and majority of us know nothing about cheese. We all eat American cheese. So I am learning via you and will try all kinds of cheese. I do not know if imported cheeses in our supermarkets are that good or just cheap or fakes? FX's answer→ James, it all depends on the cheese, but I suspect they are all from pasteurized milk and not from artisan operations if you buy them in supermarkets. There are some exceptions though, I recommend you check the company called Neil's Yard, they have a shop or two in the US and deal with really great cheeses (for the anglo saxon world that is, you'll have much bigger shops in France and Italy). The U.S. has been making world-class cheeses for quite a few years now: Cypress Grove (as another commenter already mentioned), Carr Valley, Juniper Grove, Marin French Cheese Co., Old Europe Cheese--the list goes on. Check out greatamericancheese.com for a listing of producers and retail outlets. I only mention Great American Cheese because when I was a restaurant cook, we got our cheeses from them, and one gluttonous day the chef and I tasted something like 40 cheeses with a representative. Ouf! That was too much even for me. But the range and quality of these American-made cheeses was stunning. And a question on the Graukaese: Why exactly did they used to turn gray, and why don't they anymore? Is it that the ambient molds are different now or the mazos just had more mold? Cheese-making kitchens are cleaner? I feel a need to know. FX's answer→ Laura, the mazo was full of moulds on the wood benches where they laid the cheese, much like the bearded French man's cheeses in my article about the Slow Food Fair. But nowadays everything is clean and consumers wouldn't like gray moulds. Fascinating and charming at the same time. Great story! Aha, a genuine artisanal European cheese with no rennet. Maybe I can persuade my vegetarian wife to try a little "Gray-Cheese" one day when we come as tourists. FX's answer→ Parshu, I am not sure this is the right cheese to introduce your wife to the delights of European artisan food! Two things set the stage here: raw milk, and tradition. Another excellent post about a subject dear to my heart. Indeed, I doubt that the cheese would pass muster here in Quebec, Canada, as they pitched so much cheese with a listeria scare. It literally broke my heart seeing millions of dollars in artisan cheese go down the tubes, "to be safe." I think I have a reason to visit this region, just to sample the cheese that could raise the dead. Yum! FX's answer→ Jason, in fact you might be able to heat up the milk/curds just high and long enough to kill off any excess listeria and still make this cheese I think. I am not a cheese lover but when I have it, I like a really sharp cheese, I think I would like this... will I be able to purchase a variety such as this in the US? FX's answer→ Cynthia I really don't think this cheese is sold beyond the confines of Südtyrol and Austrian Tyrol, let alone exported abroad. my english is not god, is it possible to have a german test for the articl "cheese"
FX's answer→ Elmar, ich werde versuchen, eine Uebersetzung von diesen Artikel in Deutsche zu bekommen. Sonst sind die Bilder schon auf Deutsch! Some wonderful pictures and stories on cheese making and uses, thank you very much! FX's answer→ Thank you John! I have visited your site, this is an interesting project, however for Gruyère you need to update the translation (Greyerz in German, Groviere in Italian, etc...) - just a minor point of course. I bought 3 types of Tirolian cheese from Austria but didn't have time to try them right away. When got back home that night I put them in fridge righ away. Next morning I thought there was a dead rat in my fridge. The smell was horrific. I still wondered if they would go bad in 6 hours, untill I saw your article. FX's answer→ I have all sorts of nightmares with non-commercial cheeses left in my fridge. I ought to sell the recipe to the military for an organic poison gas one of these days. FX's answer→ Kraab, this sounds like an intriguing dish with Graukaese. It would probably be easier to do this cheese yourself at home than to try and find it commercially in the US of A! this is one of my all time favourtite cheeses and I have serious graukas cravings on a regular basis. I only ever get to eat it every few years when visiting austria, and the riper the better! Graukas soup is also one of my favourites. fx, thanks so much for the useful pictures. I live in California and crave this cheese from Ortisei. Can you provide the recipe adapted to make the cheese at home without the special equipment such as a barrel and with store-bought milk? At home the only milk available is ultra pasteurized. Thanks! FX's answer→ Ah well this is beyond my knowledge, and the cheese has a very strong acidic taste that is immune to cravings!